We feel strongly about changing the status quo at Amplitude. Equity compensation for startup employees is broken. Ownership of a company is supposed to be one of the biggest upsides of joining an early stage startup, but it’s riddled with traps. Employers don’t share as much information as they should and employees don’t know the right questions to ask to make sure they get treated fairly. I have only seen prospective hires ask questions about equity compensation when they have been screwed over by a previous startup. It took being screwed over to even know where to look! Founders are in the lucky position that they have a seat at the table during any decisions that impact their equity and can advocate for what’s important to them. I’ve never seen employees be afforded that even though they’re the biggest contributors to a company’s success (much more so than the founders or investors). We’ve extended the post-termination option exercise window from the standard 90 days to ten years for all employees, regardless of how long they’ve been at the company. We provide every hire with detailed information about what the equity that we’re granting them means. The 90 day exercise window is one of the biggest “gotchas” of equity compensation, especially for employees who are new to startups. A quick primer: employees are not given shares in a company for tax reasons.1 Instead, equity compensation comes in the form of stock options, the right to buy shares. In order for an employee to own shares, they must exercise their options and spend money to buy the shares. Almost all startups have a 90 day period once an employee leaves or is terminated to exercise their vested options, otherwise they lose the options. To exercise options, the employee needs to pay the exercise price as well as the tax liability on the new shares. Under the current system, employees only get to have ownership if they can come up with enough cash within 90 days of leaving. Employees often run into this as a surprise and need to come up with a substantial amount of money in the middle of a job change. To make it all worse, there’s a good chance the shares will be worthless in the future. I know of one instance where an employee ended up spending all of their savings to exercise their options right after leaving and the company ended up going through bankruptcy, leaving the former employee with no cash and a bunch of worthless paper. We’re changing the option exercise window from 90 days to ten years for employee options.2 (We’ve actually removed any restriction on exercising post-termination and simply left in the options default exercise timeline of 10 years which applies from the start date of the grant.) This is for everyone at Amplitude—regardless of how long they’ve been at the company. I feel very strongly that once you’ve vested options they’re yours without conditions on employment. The 90 day window is an artifact of IRS tax treatments and is unfair to employees. This also allows the company to get far enough along towards liquidity so the employee knows more about whether it’s worth it to exercise in addition to not forcing them to come up with a lot of cash on short notice. Not only is this the right thing to do for employees—more startups should seriously consider it as a way to attract more talent. Too many startups consider even really basic things like the number of shares outstanding or the valuation of a company to be a trade secret. They don’t share this information to potential hires even though these basic metrics are critical to understanding the value of equity. Knowing only the number of shares in a grant is useless without knowing the denominator. In one particularly egregious example, employees of a startup were not told how many shares there were in the company—only what percentage of the employee pool they had. The company told them that typical employee option pools range between 5% and 20%, starting on the higher end of that range and coming down after future financing rounds. It later emerged that the pool was slightly above 5% before taking into account any dilution, including an already raised seed round through convertible debt. I walk potential hires through this spreadsheet so they have an understanding of different hypothetical scenarios with potential dilution included. 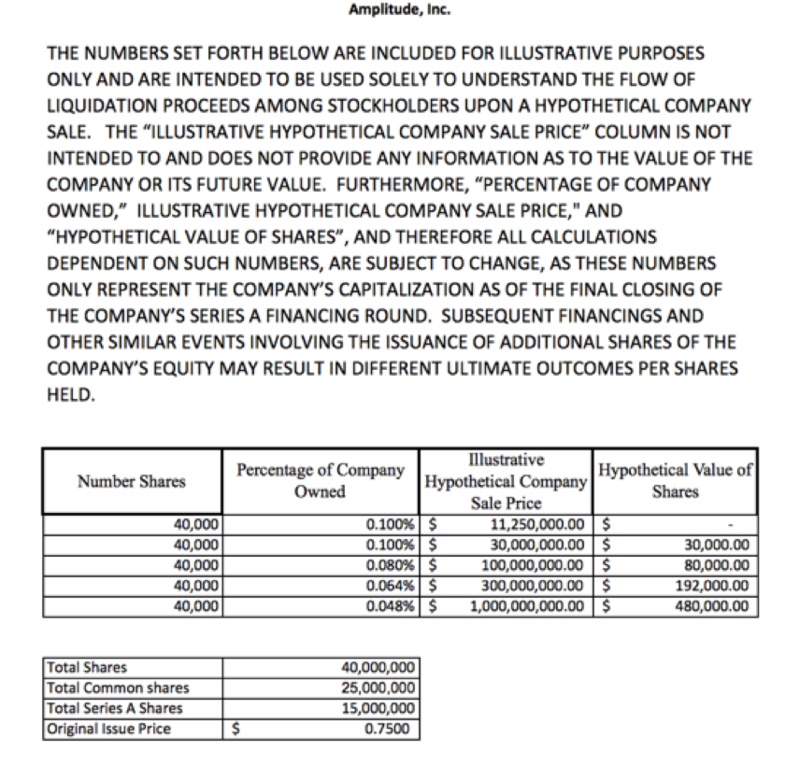 It also outlines that if we sell at less than or equal to our liquidation price, then the equity is worth nothing. Even though this is a rough picture with huge variance on it, I’d much prefer to share this than nothing. Sam Altman 5 has written about ways to improve employee equity before and Coinbase, Quora, Pinterest, and Clef 6 have begun to make moves to fix it. As far as I know, this is the most progressive take on equity compensation that I’ve seen. If there are bolder equity compensation plans out there, please let me know- we’d love to get a chance to match and improve on them! I hope that a lot of what we’re experimenting with here becomes the new standard for employee compensation at startups—it’s a huge problem that needs fixing. Granting shares to an employee requires the employee to pay taxes on the grant while the way option grants are structured do not. There are also tax implications with options that Adam D’Angelo from Quora covers in more detail. We’ve actually removed any restriction on exercising post-termination and simply left in the options default exercise timeline of 10 years which applies from the start date of the grant. Sam also talks about granting more equity to early employees and the unfavorable tax treatment. I’m very much for fixing both of them but didn’t want to make it the topic of this post. We’re in line with his suggestions around granting more equity. I agree that the tax issue needs to be fixed but it was too complex for our first iteration of equity compensation. I’ve also read about Asana and Palantir having longer exercise windows but they haven’t shared many details. Spenser Skates: Yes, thanks for sharing! Forgot to mention them in the original post, but I’m a big fan of their transparency!